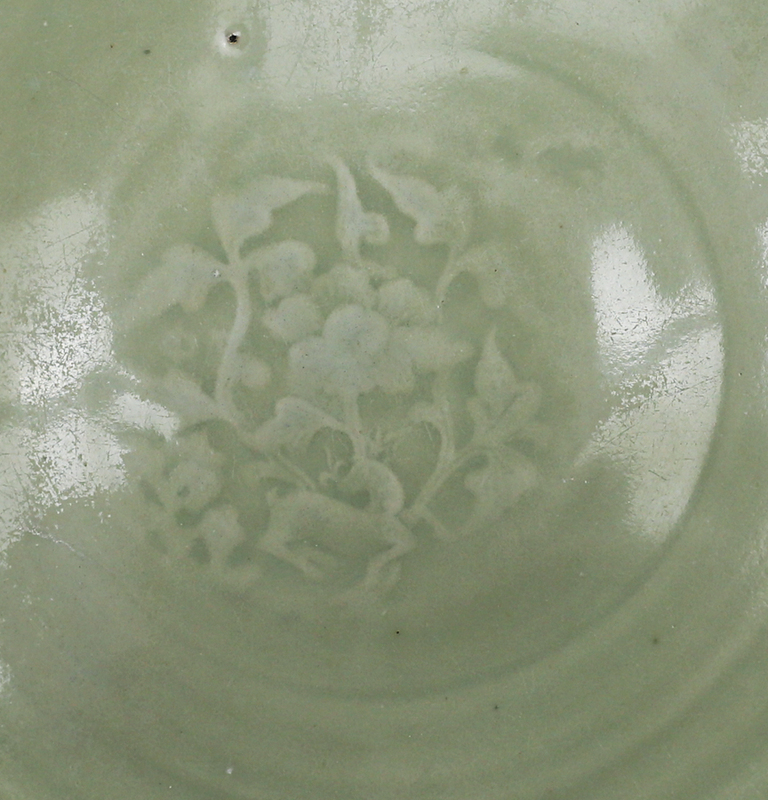 A fine and large early Ming Longquan celadon dish, incised with swirling scrolls along the inner wall, and mold-decorated in the center with a roundel of a deer supporting flowering branches. 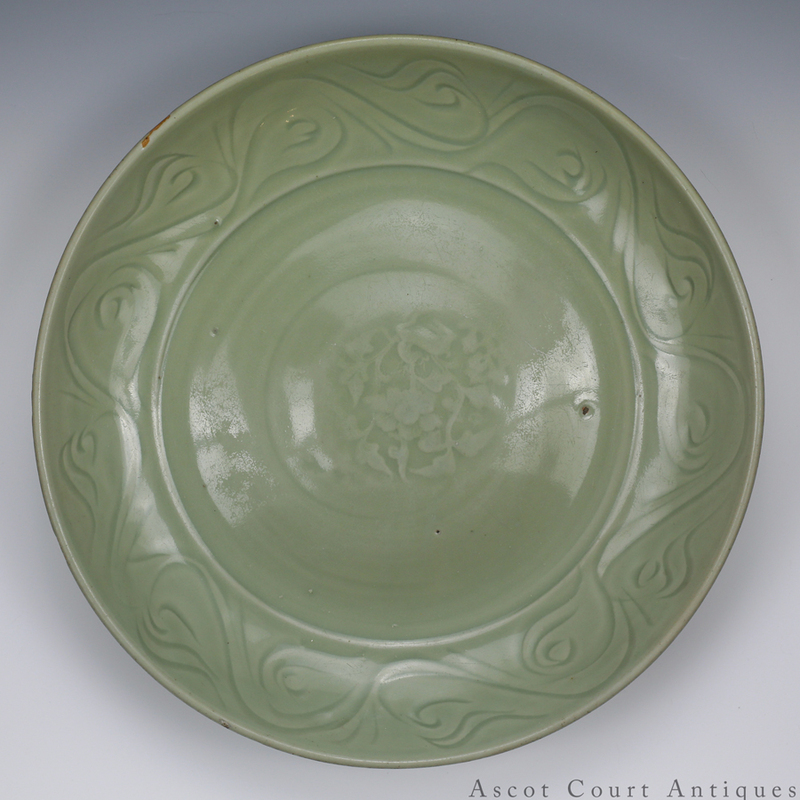 Its glaze is an absolutely wonderful shade of pale green, and remains luminous and glossy (a rare quality, as many Longquan chargers and dishes are dulled by extensive age-wear). The wave-like scrolls along the cavetto were made using two parallel bamboo scalpels. This incised pattern first emerged during the late Yuan period, but became rarer as production at the Longquan kilns increasingly favored mold-decoration over hand-finished details. 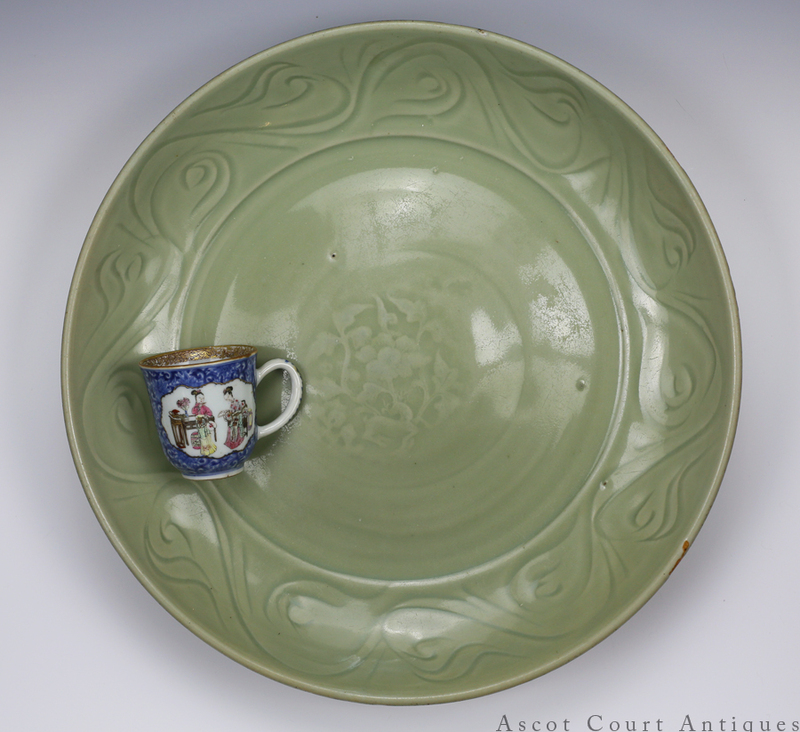 By the 14th century, Longquan celadons came to be popular with overseas export markets, as well as all strata of Chinese society. To meet consumer demand, Longquan potters relied on pre-made molds for mass production, and built amazing “dragon” kilns that trailed along entire hillsides and were capable of firing up to 10,000 pieces at once. 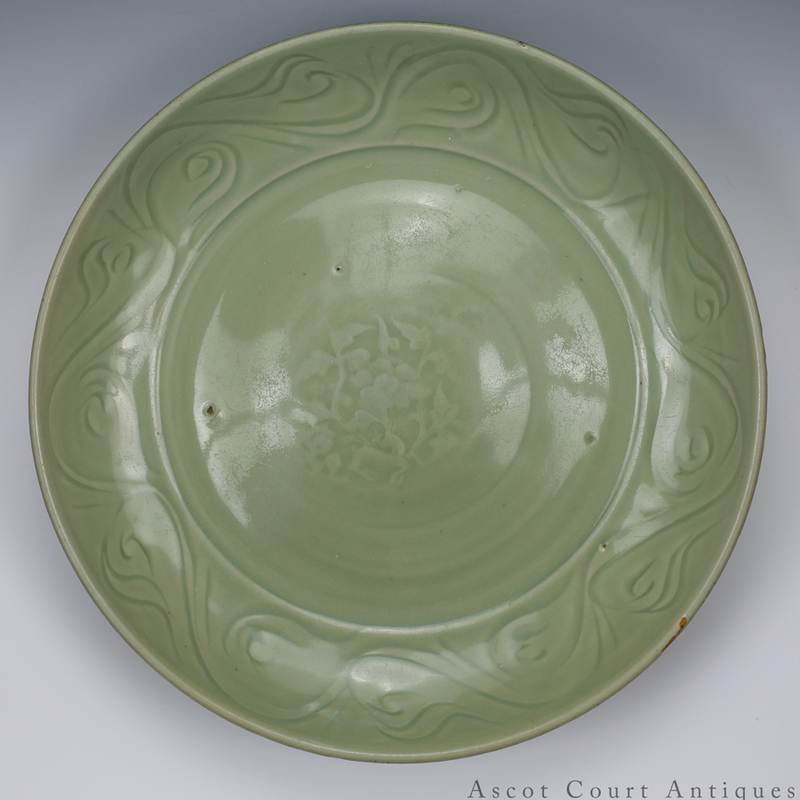 The shape of this dish, with its bowl-like concavity and rounded rim, is noticeably distinct from Yuan/Ming chargers with flaring walls and flattened rims. Although this dish is non-imperial minyao, its form, foot rim, and base is similar to a Yongle period Longquan dish from the J.T. 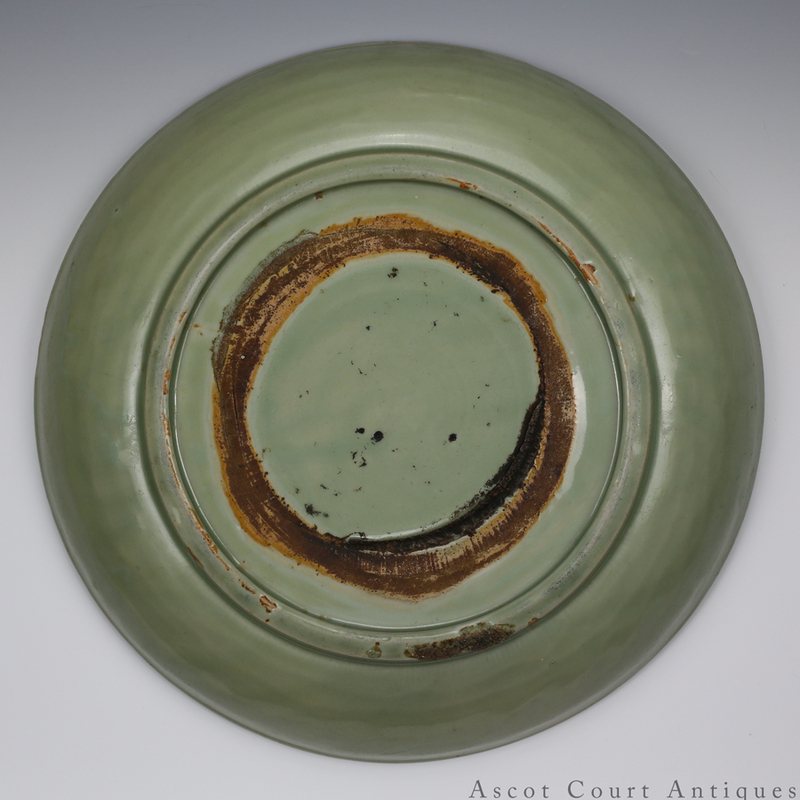 Tai & Co collection (Sotheby’s sale 8722 lot 86), suggesting that it was perhaps made around the same period.